Who’s ready to live #CrazyHealthy? My friends at POM Wonderful are and boy oh boy am I excited to share with you this new gem I came up with! But, before we get to the goods, I’ve got to fill you in on a few secrets. Well, because of the effects pomegranate juice has on memory and cognition! In a preliminary 2013 UCLA study, it was found that a small group of older adults with age-related memory complaints who drank 8 oz. of pomegranate juice daily had increased verbal memory per- formance and functional brain activity in fMRI testing after just four weeks. *These early scientific re- sults on the impact of pomegranate juice on the brain have not yet been adequately studied. Further clinical research on larger populations is needed to help establish causation and to determine the long term effects of pomegranate on memory and cognition. If that’s not enough, here’s a few facts about the ruby red wonder. And, because POM Wonderful is committed to their research, I love the findings that are promising in the post-workout realm, too! 100% pomegranate juice is powered by unique polyphenols that early research suggests have promising results for post-workout muscle strength recovery. Certain types of polyphenol antioxidants, like those found in pomegranate juice, may help increase nitric oxide bioavailability by protecting it from breaking down in the body. Nitric oxide helps your body get the oxygen and nutrients in needs during exercise. *Although the research reported is promising, additional clinical research is needed to estab- lish causation and the potential impact of pomegranate polyphenols and exercise. If you’re ready to enjoy a smoothie that tastes like a little bit of heaven, then gear up for this beauty! I’m no chef, but I was blessed with a little cheat sheet at the Food and Nutrition Conference Expo this past October that gave me the low down on pomegranate pairings! Suffice it to say, apples, butternut squash and pomegranate are a trifecta of flavor when paired together. 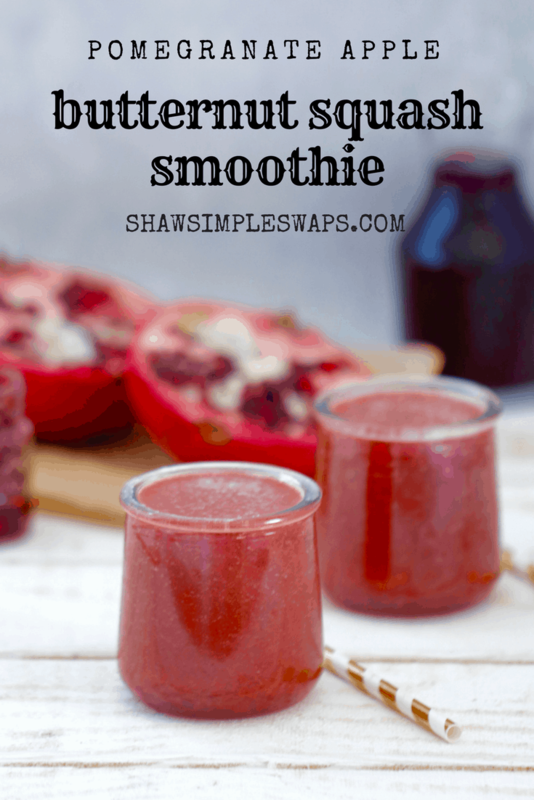 Before I show you the smoothie, here’s a few other gems I’ve whipped up with pomegranates so you can rest easy knowing you can use this ruby in more than one way! Pomegranate Apple Smoothie with Butternut Squash, The perfect refreshing drink that's packed with fiber, too! 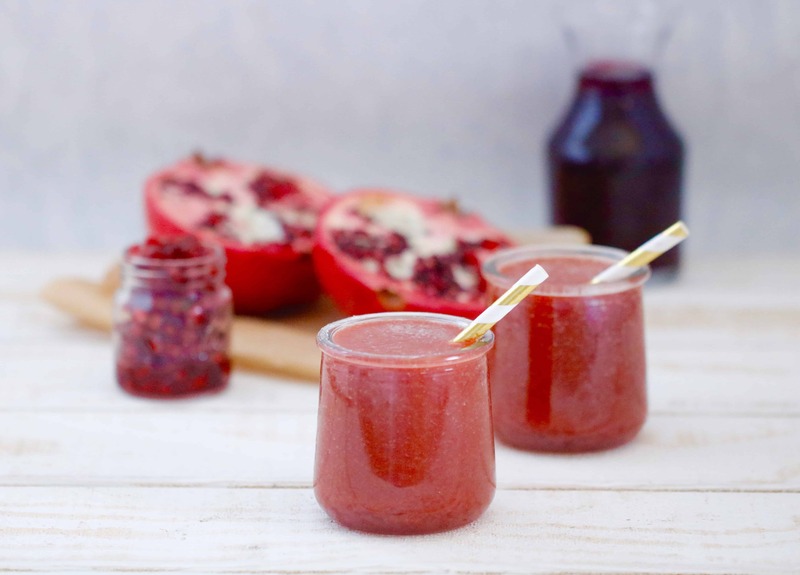 To a blender add POM Wonderful 100% Pomegranate Juice, apple, butternut squash and cinnamon. Puree until smooth, about 2 minutes. Serves 1-2 depending on your desired fullness! 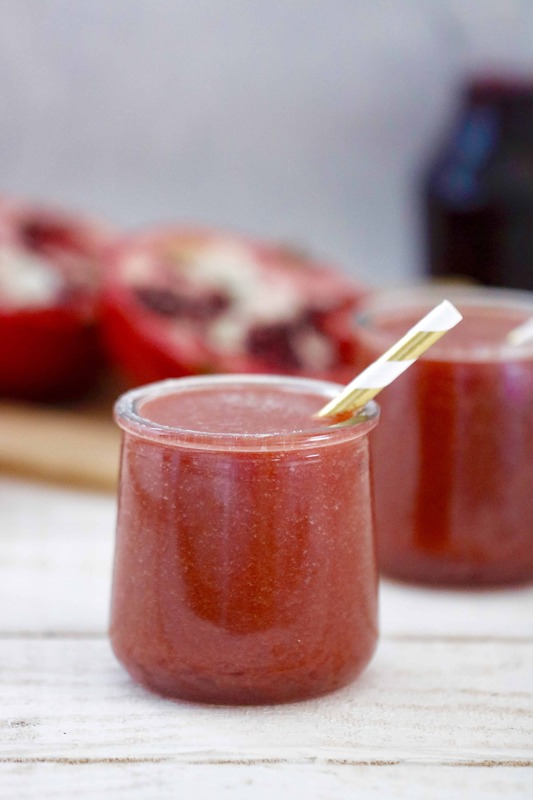 While I’m a little biased and think you should make this smoothie (hello 7 grams of fiber), be sure to check out the other #CrazyHealthy ideas below from members of The Recipe ReDux using POM Wonderful this season! Yum! I would have never thought to include butternut squash, sounds so good!! This smoothie looks amazing! Love that you use butternut squash. Always have some in my freezer so definitely trying this! Thanks so much! Let me know what you think! The butternut squash in this intrigues me. I always say I never drink my veggies (green smoothie – blech) but I would definitely try this one! You and me both (still struggling with the green smoothies lol). I hope you and Mia enjoy this! Now I’m just going to have to add butternut squash to my smoothies! I hope you do! Let me know if you like it! Do you cook the squash before you freeze it and then use it! Or is it used frizen raw! I love this smoothie and the butternut squash addition! What a refreshing and seasonal drink to have for breakfast or after a workout! I just love the butternut squash in this, it makes it the perfect recipe for picky toddlers 🙂 so yummy! Oh yay! So glad Ran enjoyed this! Why have I never added pom juice to a smoothie? So so amazing! I would’ve never thought to put these ingredients in a smoothie, but they taste so good! Thanks! I’m so glad you enjoyed!